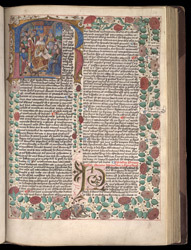 This manuscript provides one of the best documentations of the use of astrology by medieval kings in the picture on this page. It is in a section of the famous treatise by the 13th-century Tuscan astrologer Guido Bonatti on annual revolutions or the sun's entry into Aries at the beginning of the astrological year and movement through the zodiac. Placing the king's picture at this point compared his power in his kingdom with that of the sun upon the world. The bishop and presenter of the book point to the stars.